Dr. Volker Bernhardt, known in the golfing world as “Dr.Golf” has begun another of his legendary moves to push golf into the limelight, this time working with UNICEF. A world tour playing in every corner of the world, challenging other players to help and ultimately raising money to help the worlds less fortunate children. As an outstanding golf coach and having researched golf scientifically he also has what it takes to compete with his latest win as a Champion Golf Pro at the Atalaya Spanish Senior Championship in December 2010 (see: www.drgolf.info). Volker has already travelled the world many times over developing the Golf Academies for the Golf legend Gary Player. During all his travels he has seen both very rich and very poor people. Living as he does amongst the wealthy population in Marbella, Spain, he has decided to do something for the unfortunate ones. “Dr.Golf” wants to put his special skills on offer and has decided to travel to the best golf resorts and courses around the world to challenge at least three golf players at each venue. Should they lose the game against Dr.Golf they need to donate the agreed amount of money to Charity. Volker chose UNICEF as his main Charity organization because they help Children and are based in most countries around the world. Treat people like you would like to be treated and help wherever you can. His world tour started at the very exclusive Golf Club “Capitals” in Lithuania, where he spent 10 days teaching all age groups. 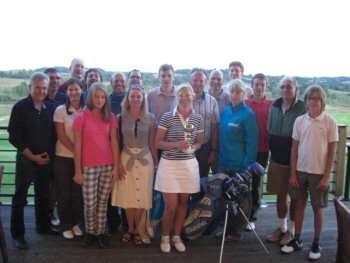 For the farewell “Dr.Golf” organized a Charity tournament with the help of the very competent management team of the club. Simone won the tournament with her outstanding performance. During the prize giving “Dr.Golf” got so excited about the good people that he gave a substantial amount of his coaching fee direct to UNICEF. 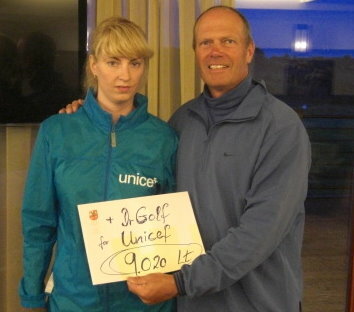 He even auctioned his golf clubs for the good cause and with the entry fees for the tournament the representative of UNICEF Jovita got 9.020 Lt., a real outstanding donation Volker learned later from Jovita who was part of the prize giving ceremony. A special thank you goes to Aurelia & Aurelius Rusteika who organized and supported the visit of “Dr.Golf” in a big way, the management team and all the players of the Club who joined the coaching program, also coach EgidijusBaleisis. The next Charity event is already scheduled for mid September in Spain and afterwards the world tour will continue taking “Dr.Golf” to Asia.